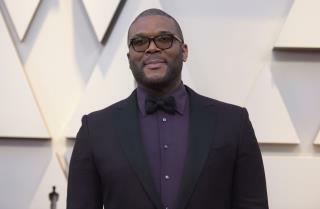 (Newser) – One of Tynesha Evans' daughters is calling Tyler Perry an "angel on Earth" after the star stepped up following Evans' murder in Georgia over the weekend. Per an Alpharetta Department of Public Safety post on Facebook, Evans, 45, was gunned down Saturday in a Wells Fargo parking lot; her on-again, off-again boyfriend, 58-year-old Othnel Inniss, was taken into custody and charged with murder. Per a GoFundMe page, Evans was a single mom with four kids, two of them minors, and thanks to a phone call the kids received after their mom was killed, they won't be evicted from their apartment. "I answered [the call] and the person on the other end said, 'This is Tyler.' … I said, 'Tyler who?' and he said, 'Tyler Perry,'" daughter Audrey Turner tells USA Today. "At that point, I just broke down crying." Kudos to Mr. Perry. Not everyone has compassion for strangers who have been dealt a bad hand in life, and not everyone who has compassion has the means to help in this way. This is the type of behavior that stops racism.